A stunning three bedroom house arranged over two floors boasting modern and spacious accommodation throughout, a wonderful private garden and off-street parking to the front. The property is situated moments from a range of shops and amenities that can be found in Barnet while High Barnet Station is only a short distance away for links around the city. 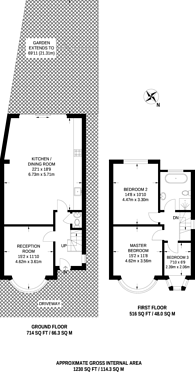 1,230 (114 Sq M) approx.